1 Facultad de Farmacia, Universidad de Valparaiso, Gran Bretaña 1093, Valparaiso, Chile. 2 Centro Regional de Estudios en Alimentos Saludables (CREAS), Valparaiso, Chile. 3 Departamento de Biologia, Facultad de Ciencias, Universidad de Chile, Las Palmeras 3425, Santiago, Chile. 4 Departamento de Fisiologia, Universidad de Valparaiso, Gran Bretaña 1111, Valparaiso, Chile. 5 Max-Planck-Institute for Molecular Physiology, Otto-Hahn-Str. 11, 44227 Dortmund, Germany. Endothelial cells are directly involved in many functions of the cardiovascular system by regulating blood flow and blood pressure through Ca2+ dependent exocitosis of vasoactive compounds. Using the Ca2+ indicator Fluo-3 and the patch-clamp technique, we show that bovine adrenal medulla capillary endothelial cells (B AMCECs) respond to acetylcholine (ACh) with a cytosolic Ca2+ increase and depolarization of the membrane potential (20.3±0.9 mV; n=23). The increase in cytosolic Ca2+ induced by 10µM ACh was mimicked by the same concentration of nicotine but not by muscarine and was blocked by 100 µM of hexamethonium. On the other hand, the increase in cytosolic Ca2+ could be depressed by nifedipine (0.01 -100 µM) or withdrawal of extracellular Ca2+. Taken together, these results give evidence for functional nicotinic receptors (nAChRs) in capillary endothelial cells of the adrenal medulla. It suggests that nAChRs in B AMCECs may be involved in the regulation of the adrenal gland's microcirculation by depolarizing the membrane potential, leading to the opening of voltage-activated Ca2+ channels, influx of external Ca2+ and liberation of vasoactive compounds. Key terms: capillary, endothelial cells, intracellular Ca2+, nicotinic receptor, and voltage-activated Ca2+ channels. Endothelial cells (ECs) participate in the regulation of blood flow and blood pressure through the secretion of vasoactive compounds such as prostacyclin (PGI2) (Lückhoff et al., 1988), endothelium-derived relaxing factor (EDRF) (Lückhoff et al., 1988; Furchgott and Zawadzki 1980), identified as nitric oxide (NO) (Palmer et al., 1987) and endothelium-derived hyperpolarizing factor (EDHF) (Taylor and Weston, 1988). The signal transduction for the secretion of these compounds is an increase in cytosolic Ca2+ when agonists like ACh, bradykinin, ATP, histamine and thrombin bind to specific receptors (Himmel et al., 1993). One of the mechanisms regulating the increase in cytosolic Ca2+ besides its liberation from intracellular storage is the influx of Ca2+ions through Ca2+channels. In this context, it is well established, that voltage-activated Ca2+ channels (VACCs) are present in ECs of capillaries (endothelium without smooth muscle cells) but not in large blood vessels (Bossu et al., 1989; Delpiano and Altura, 1996; Vinet and Vargas, 1999; Delpiano, 2000); they are involved in Ca2+ influx. On the other hand, it is known that ECs express functional acetylcholine receptors of a muscarinic and nicotinic nature (Olesen et al., 1988; Macklin et al., 1998). The action of ACh on blood vessels associated with a rise in cytosolic Ca2+ and vasorelaxation is a well-validated endothelium-dependent mechanism (Furchgott and Zawadski, 1980; Furchgott et al., 1987; Emerson and Segal, 2000). Muscarinic receptors (mAChRs), when stimulated by ACh induce vasodilatation mediated by the release of nitric oxide (Furchgott and Zawadski, 1980). Although nAChRs have already been reported in human ECs of large blood vessels (Haberberger et al., 2000; Macklin et al., 1998) their functional presence in ECs of capillaries has not been reported, besides the hyperpolarizing effect of ACh on capillaries of hámster cheeks (McGahren et al., 1998). The aim of this study was to investigate whether BAMCECs exhibit functional nAChRs by monitoring changes in the cytosolic Ca2+ and the membrane potential, and to explore whether VACCs may be involved in the Ca2+ response. BAMCECs were obtained according to Vinet et al. (2000). Briefly, glands were perfused through their veins with a modified Locke solution containing 0.25% collagenase (Bóhringer Mannheim, Germany). Dissociated cells were suspended in Percoll (Pharmacia, USA) and centrifuged at 20,000 g for 20 min. The band containing the highest density of ECs was seeded on glass cover slips and plated into 35 mm petri dishes with nutrient medium mixture F12 Ham (Sigma Chemical, USA) supplemented with 10% fetal calf serum (Biofluids, Rockville, USA), 50 U/mL penicillin, 50 ¡ig/ml streptomycin, at pH 7.2 and incubated at 37°C in a humidity atmosphere of 5% C02. BAMCECs were identified as ECs by their polygonal shape and the fluorescence induced by the specific uptake of an acetylated low-density lipoprotein (Dil Ac-LDL; Molecular Probes, USA) (Voyta et al., 1984). As described elsewhere (Luxoro et al., 1997), BAMCECs were loaded for 20 min with 7 µM Fluo-3 AM (Molecular Probes, USA) and 0.094% pluronic acid in modified Krebs solution (in mM: 140 NaCl, 5 KC1, 2.6 CaCl2 1 MgCl2 2.5 NaHC03 10 glucose, 5 Na-HEPES', at pH 7.4). Light emitted by Fluo-3 emerging from changes in cytosolic Ca2+ ([Ca2+]i ) of a single cell, placed in a superfusion chamber (volume: 200 mi) on a microscope stage (Leitz, Wetzlar, Germany) with appropriate filters (excitation 490 nm; emission 530 nm) was measured continuously with a photomultiplier (Hamamatsu, Japan). Data were digitized at 3 Hz by an analogue converter and analyzed by using the Global Lab software (Data Translation, USA). The magnitude of the fluorescent signal was presented as a ratio according to the equation ΔF/Fb = (Ft - Fb) / Fb, where Ft is the fluorescence value of Fluo-3 at time "t" and Fb is it basal fluorescence, as previously described (Kao et al., 1989). The membrane potential was measured in single cells at room temperature by using the classical patch-clamp technique (Hamill et al., 1981) with an EPC-7 patch-amplifier (Darmstadt-Eberstadt, Germany) in the whole-cell configuration and current-clamp mode. Soft glass pipettes, heat polished and pulled with a vertical puller (David Kopf, USA) were filled with intracellular solution (in mM: 130 KC1, 1 CaCl2, 2 MgCl2, 20 HEPES/KOH, 5 EGTA/KOH, at pH 7.2) and had a resistance of 3 to 5 MQ. Single cells were recorded on the stage of an inverted microscope (Nikon, Diaphot, Japan) and superfused with an extracellular solution (in mM: 140 NaCl, 5 KC1, 2.6 CaCl2, 2 MgCl2, 2.5 NaHC03, 5 HEPES/ NaOH, 10 Glucose, at pH 7.4). Cells with membrane potentials of at least -40 mV and able to depolarize with a 60 mM extracellular K+ concentration (high K+) were selected. A similar criterion was used for Ca2+ experiments. Data were continuously monitored and analyzed by a 12-bit analogue converter board (Axon Instruments, USA). Acetylcholine, hexamethonium and muscarine were obtained from Sigma (USA). Nicotine and nifedipine were obtained from Research Biochemicals International (RBI, USA). Where appropriate, the results were expressed as the mean ± standard error (S.E.M.). Statistical differences were assessed with Student's i-test, considering a P value of < 0.05 as significant. Single freshly dissociated BAMCECs responded to high K+, applied into the medium, with membrane depolarization and increase in [Ca2+]i . Figure 1A illustrates the effect of high K+. The inset shows steps depolarizations produced by additive concentrations of high K+. The increase in [Ca2+]i induced by high K+ exhibits a fast onset with a rapid recovery followed by a delayed decrease. 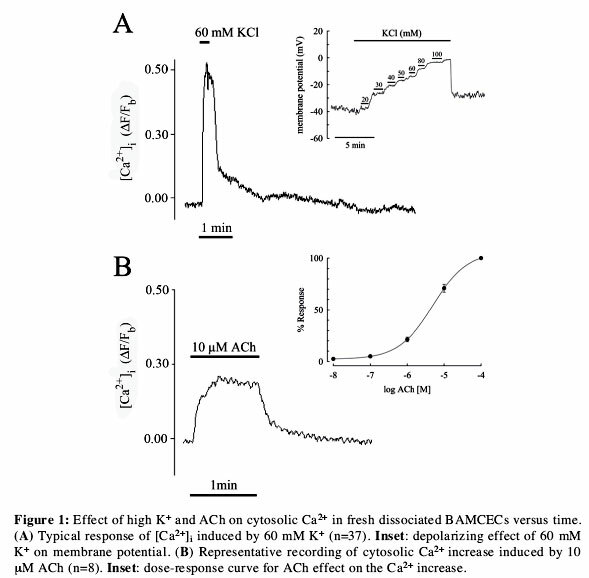 Application of 10 µM ACh, as illustrated in Figure 1B, elicited a rapid and sustained rise in [Ca2+]i . In 8 different experiments we observed a mean ΔF/Fb change in Ca2+ of about 0.325±0.088 units. After a wash out of ACh from the medium the Ca2+ signal declined to the baseline in a time-span of about 1 to 2 min. The inset of Figure IB illustrates the dose-dependent Ca2+ increase induced by ACh with an EC50 of 3.98±0.04 µM , that reaches saturation by about 100 µM ACh (n=8). Using nicotine and muscarine and the nicotinic antagonist hexamethonium we approach the nature of the nAChRs. Figure 2A illustrates the effect of muscarine and nicotine on [Ca2+]i . 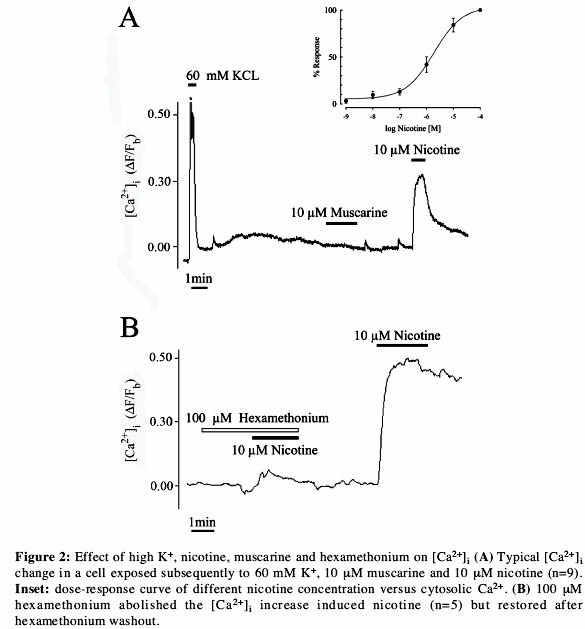 Figure 2A shows that when muscarine and nicotine were added (both at 10 µM) to the medium, 10 minutes after the test stimulus with high K+, only nicotine was able to induce increase in [Ca2+]i but in 6 other experiments no effect was observed with muscarine. The [Ca2+]i elevation induced by 10µM nicotine reached 57.0±2.3% (n=9) of the response induced by high K+. The inset of Figure 2A illustrates a dose-response curve for nicotine with an EC50 of 1.51 ±0.05 mM (n=4) that reached saturation at 100 mM. To further investigate the nature of ACh receptor, hexamethonium (100µM) was applied to the medium. As illustrated in Figure 2B, this nicotinic antagonist markedly depressed the increase in [Ca2+]i (n=5). After the wash out of hexamethonium, a second stimulation with nicotine restored the cytosolic Ca2+ response. 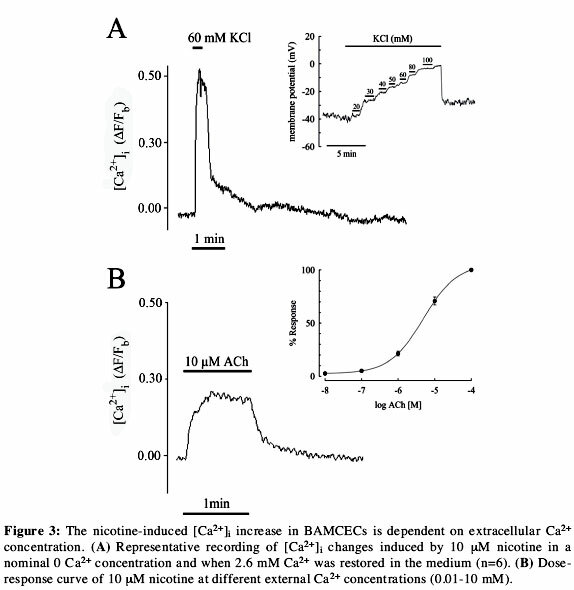 In order to investigate the source of the cytosolic Ca2+ changes induced by nicotine, BAMCECs were superfused with a Ca2+-free medium containign 0.5 mM EGTA. As shown in Figure 3A, under these conditions in all, nicotine sensitive BAMCECs measured under Ca2+-free medium (n=6) nicotine, failed to induce a [Ca2+]i increase. Figure 3B illustrates the dose-response curve for BAMCECs stimulated with 10 µM nicotine that were superfused under different extracellular Ca2+ concentrations between 0.01 to 10 mM (n=4). It can be seen that the magnitude of the nicotin-induced increase in [Ca2+]i was dependent on the extracellular Ca2+ concentration. We evaluated the participation of VACCs in the Ca2+ influx by applying nifedipine as a blocker of VACCs. 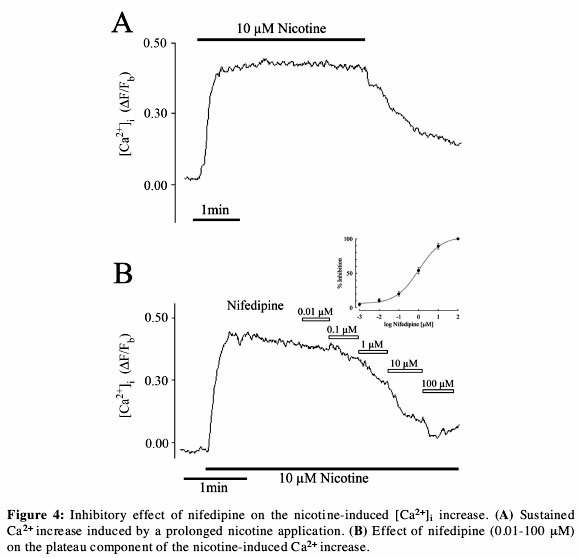 As observed in Figure 4A, the long-term application of nicotine (5 min) induced a plateau in the [Ca2+]i increase. When nifedipine was applied at different concentrations between 0.01 to 100µM , the plateau was gradually inhibited, as illustrated in Figure 4B. The inhibition reached a máximum at about 100 µM with an IC50 of 0.93±0.7 µM for nifedipine (n=6). Other inorganic Ca2+ channel blockers like Co2+, Cd2+ or Ni2+, similarly depressed the cytosolic Ca2+ increase (not shown). 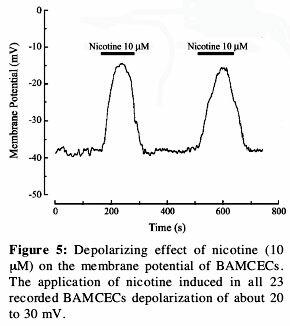 Nicotine applied in concentration between 0.01 to 10 µM depolarized the membrane potential of BAMCECs. Figure 5 illustrates two typical depolarizations induced by a concentration of nicotine of 10 µM (n=6). The mean amplitude of the depolarization amounted to 20.3±0.9 mV (n=23) (not shown). In this study we bring evidence for the functional presence of nAChRs but no mAChRs in BAMCECs. We found that nicotine and ACh application stimulated changes in Fluo-3 fluorescence intensity. Though these changes were not calibrated, they correspond to qualitative changes in [Ca2+]i . The fact that the [Ca2+]i increase and the membrane depolarization induced by ACh was mimicked by nicotine, but not by muscarine, and was blocked by hexamethonium (Fig. 2), strengthens our assumption that nAChRs but not mAChRs, may be present in BAMCECs. The inhibition of the increase in [Ca2+]i by nifedipine, a blocker of VACCs (Fig. 4B), as well as by inorganic Ca2+ blockers (not shown), lead us to assume that we are dealing with ECs of capillaries deprived of smooth muscle cells and supports the idea that VACCs of the L-type may be involved. To date it is well established that only ECs of capillaries exhibit VACCs of the L- and T-type (Bossou et al., 1989; Vinet and Vargas, 1999; Delpiano, 2000) but no ECs of large blood vessels (Colden-Stanfield et al., 1987; Johns et al., 1987; Olesen et al., 1988; Bregestovski et al., 1988; Vargas et al., 1994). From these findings we could hypothesize that activation of nAChRs in BAMCECs could induce a chain of events with a primary influx of divalent cations, as it is known that nAChRs have a broad permeability to them and some a-sub-units allow relatively more influx of Ca2+ over Na+ ions (Liu and Berg, 1999), leading to a Ca2+ release from intracellular storage and concomitantly membrane depolarization that would activate VACCs and allow a secondary influx of external Ca2+ reinforcing the initial cytosolic increase, e.g., a mechanism already known as Ca2+-induced Ca2+ release (CICR) (Sharma and Vijayaraghavan, 2001). Our hypothesis is supported by the fact that removal of external Ca2+ abolished the whole [Ca2+]i increase (Fig. 3), where nifedipine, that blocks influx of Ca2+ through VACCs, mainly block the plateau phase of the [Ca2+]i increase (Fig. 4B). Our results concerning the nicotine effect on [Ca2+]i disagree with similar studies in BAMCECs reported by Castro et al. (1994). The latter did not find any changes in [Ca2+]i when endothelial cells were stimulated by nicotine. These authors used co-cultures of chromaffin cells together with endothelial cells and applied nicotine as a test to identify endothelial cells. They argued that only chromaffin cells respond to nicotine, in agreement with previous authors (Nassar-Gentina et al., 1997). In this study we used cultured endothelial cells identified previously in their specificity by acetylated LDL (Voyta et al., 1984). We excluded chromaffin cells from culture and selected BAMCECs for experiments with stable membrane potential of about -40 or more mV that were able to depolarize with high K+ as criteria for cell damage or inability to respond to nicotine. The cell morphology itself was not a criterion for cell viability. The non-responding ECs to nicotine in the study of Castro et al. (1994) might be due to cell damage or desensitization. The effect of nicotine observed in BAMCECs has not been reported so far. It is interesting that BAMCECs and chromaffin cells are physiologically related in the adrenal gland, the latter also having nicotinic and muscarinic receptors (Nassar-Gentina et al., 1997). In this regard, it can be postulated that BAMCECs interact with chromaffin cells during stress-induced catecholamine release (Luxoro et al., 1997). The presence of nAChRs has also been reported in other ECs like pulmonary arterial (Haberberger et al., 2000), carotid artery (Kawashima et al., 1990), and cerebral microvessels (Ikeda et al., 1994). Additionally, ECs synthesize ACh that could be liberated as an autocoid (Kawashima et al., 1990). Therefore we suggest that stimulation of nAChRs in BAMCECs releases vasoactive substances (Lückhoff et al., 1988; Furchgott and Zawadzki 1980; Palmer et al., 1987), which by acting on neighboring sphincter capillaries produce vasodilatation and could counteract the vasoconstriction of catecholamine released by chromaffin cells. Such vasodilatation would provide an appropriate transport and redistribution of cathecholamines outside the gland. In conclusión, we reported that functional nAChRs are present in BAMCECs because ACh stimulates changes in [Ca2+]i that could be mimicked by nicotine but not muscarine (Fig. 2A). Moreover, the nicotinic effect was strongly dependent of the presence of Ca2+ in the medium (Fig. 3) and VACCs (Fig. 4B). Further experiments with electrophysiological methods would be necessary for a better understanding of the interaction between BAMCECs and chromaffin cells in the adrenal gland microcirculation. This work was supported by Grant # 1960302 from FONDECYT, Chile. We wish to thank Dr. Maritza Rebolledo for providing the adrenal glands.